Our planet has some pretty freaky creatures and this is one of the freakiest. 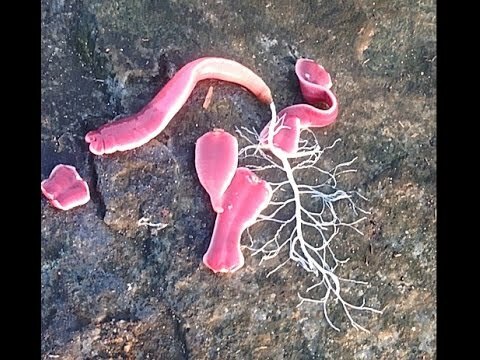 This pink wiggly thing is a marine ribbon worm and, as the name suggests, they are normally found in the sea, not on land. It’s hard to know where this clip was filmed but investigations suggest that the worm belongs to the genus Gorgonorhynchus. The white gooey stuff shooting out of it’s body is actually a proboscis, a sort of elongated tongue used for eating and sucking. A ribbon worm’s proboscis is sticky and it will entangle its prey – perhaps a clam, a sea slug, or even another worm. Once captured the worm will engulf its prey whole. There are over 1000 types of marine ribbon worms, but only a few have such a strange appendage. Sadly, despite this looking like a collection of worms it is one single worm and it is falling apart as it slowly dies. As a ribbon worm’s normal habitat is the water, as soon as they are removed from it their delicate bodies start to rupture, as there is no water pressure to hold them together. The separated body parts continue to wiggle as the creature expires. This worm is likely to be shooting out its strange proboscis not to capture prey but as a last attempt to stay alive. If you look carefully it has actually chosen to detach it from its body. Marine worm specialist Dr Sebastian Kvist, associate curator of invertebrates at Royal Ontario Museum confirms that this ribbon worm is in poor health. “My best guess is that the worm is dying and that’s why it’s breaking apart,” he says. Below is another freaky video of a ribbon worm – this time its green, and it is shooting out a pink proboscis. National Geographic have identified the worm as Lineus fuscoviridis. Its such a shame to watch the ribbon worm dying I never thought i’d feel sorry for a worm.